Understanding GIS: An ArcGIS Pro Project Workbook, Third Edition, is a textbook that introduces college-level or graduate students in GIS-related disciplines to the speed, efficiency, and 2D/3D capabilities of ArcGIS Pro by working through a single project. It can also be used by GIS professionals who are transitioning from ArcGIS Desktop or who want to expand their proficiency and understanding of ArcGIS Pro, as well as professionals in other fields who want cross-training in GIS. Readers work through nine lessons and 35 exercises in sequence as they use ArcGIS Pro to find the best location for a new park along the Los Angeles River in Southern California. Each exercise offers step-by-step instructions and graphics that confirm exercise results. In addition to helping readers become proficient with ArcGIS Pro, the book has the larger goal of teaching a geographic approach to problem solving. Conceptual information is supplied as needed for each exercise in the body of the text, in callout boxes, or in sidebars. Readers will explore the use of the advanced 2D and 3D visualization and analytical capabilities of ArcGIS Pro. In addition, they will work with Esri ArcGIS Online and Esri Story Maps apps. By the end of the last exercise, readers will have completed all the important phases of a GIS analysis project including planning, building a data model, and performing spatial analysis. They will also incorporate the results of their analysis in an Esri Story Map Journal app that will present the best locations for a Los Angeles River park. All project data needed to complete the exercises is downloadable from the book’s resource web page. This is real data, and it includes United States Census data and data provided by the City of Los Angeles. 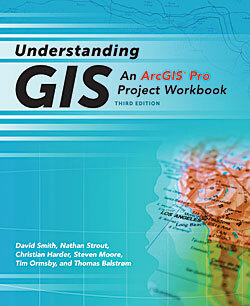 The book provides access to ArcGIS Desktop software, which includes ArcGIS Pro. The book’s authors are David Smith, spatial instruction manager for the Center for Spatial Studies; Nathan Strout, director of spatial technology for the Center for Spatial Studies; and Steven Moore, director of the Center for Spatial Studies—all staff members at the University of Redlands in California. Additional authors include Thomas Balstrøm, associate professor of geoinformatics at the Department of Geosciences and Natural Resources Management, University of Copenhagen, Denmark; Christian Harder, a technology writer and information designer at Esri; and Tim Ormsby, a technical writer at Esri. Esri Press, 2017, 362 pp., ISBN: 9781589484832, (print) or ISBN: 9781589484955 (e-book).